Despite headlines reminding investors about a class action lawsuit against the company, here's what pushed the stock higher. Shares of Camping World Holdings (NYSE:CWH), a provider of services, protection plans, and products for the recreational vehicle market, were up 10% as of 3 p.m. EDT on Thursday after investors digested a couple of positive developments across the industry, and an upbeat note about future demand. The first thing likely supporting Camping World's move higher today was LCI Industries (NYSE:LCII) topping revenue estimates, pushing its stock 12% higher as of 3:50 p.m. After years of strong growth in the RV industry, investors and analysts have been concerned about entering a cyclical downturn, and that's weighed on stock prices. LCI posted 9% revenue growth versus the prior year, to $604 million. That was slightly ahead of estimates, even if it was a slowdown from the second quarter's 25% revenue growth. In fact, LCI Industries investors should be thrilled that the company posted 9% revenue growth despite a 12% decline in RV wholesale shipments, as it's proof the company has made progress diversifying through adjacent markets. Fox Factory Holding (NASDAQ:FOXF), a manufacturer of performance-defining products for a slew of recreational vehicles, also jumped 17% as of 3:50 p.m. EDT on Thursday after releasing strong third-quarter results. Fox Factory topped revenue estimates and posted $175.80 million during the quarter. Better still was its bottom line, which checked in at $0.72 per share, easily topping analysts' estimates of $0.66. The third quarter was strong enough for management to raise its full-year guidance for revenue to between $610 million and $620 million and adjusted EPS in the range of $2.15 to $2.21. While these two developments are broadly good news for the industry -- and Camping World in particular -- there was another report that could help ease investors' concerns about a possible downturn. Global Market Insights published a report on Wednesday that suggested consumer spending on recreational activities will boost the RV market through 2024. In fact, it estimates the RV market to be valued at roughly $36 billion in 2017 and says it is poised to grow to $56 billion by 2024, roughly a 6% compound annual growth rate. Despite headlines today reminding investors about a class action lawsuit against Camping World, this is a good lesson to pay more attention to financial results around the industry, as well as detailed reports about future industry demand. 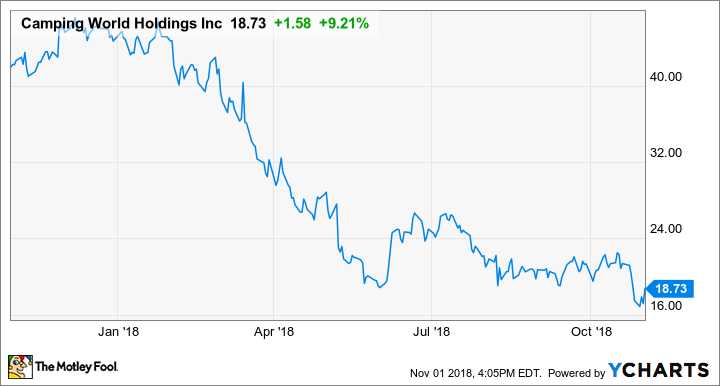 For Camping World investors who have watched the stock get pummeled this year, it's easy to forget that it's on pace for a record year of RVs sold and that the company is attracting a number of younger buyers -- a big plus for its current business. Now investors will turn to the company's third-quarter financial results, due to be released after the market closes on Nov. 6, to see if today's optimism is warranted.